March 1, 2014 | We purchased an additional 1,000 acres for the Monte Mojino Reserve in Alamos, Mexico, which now totals 14,500 acres and conserves some of America’s northernmost tropical deciduous forests. We have been purchasing land here since 2003 to protect this vanishing ecosystem, which contains a rich assemblage of species representative of the western Sierra Madres – including five recently documented cat species. 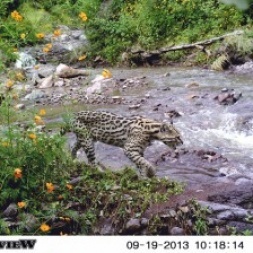 In the Monte Mojino Reserve, Mexico’s national park service and the University of Querétaro recently completed a monitoring survey using camera traps and discovered the presence of five cat species – jaguar, ocelot, bobcat, margay and mountain lion – as well as a diversity of prey species. Jaguars and other large carnivores are keystone species whose presence is critical to maintaining the integrity and balance of all living things within the surrounding landscape. Remove the keystone species and the ecosystem is at risk of unraveling. 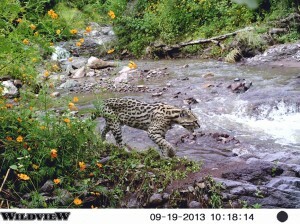 Using camera trap data, biologists determine if the population of jaguar or other cat species is stable or declining, which in turn can help in the protection of wildlife corridors.